Some bottled water products are geological. Mineral, artesian, spring, sparkling, and groundwater are from natural sources. But much of the bottled water sold today is straight from a tap. 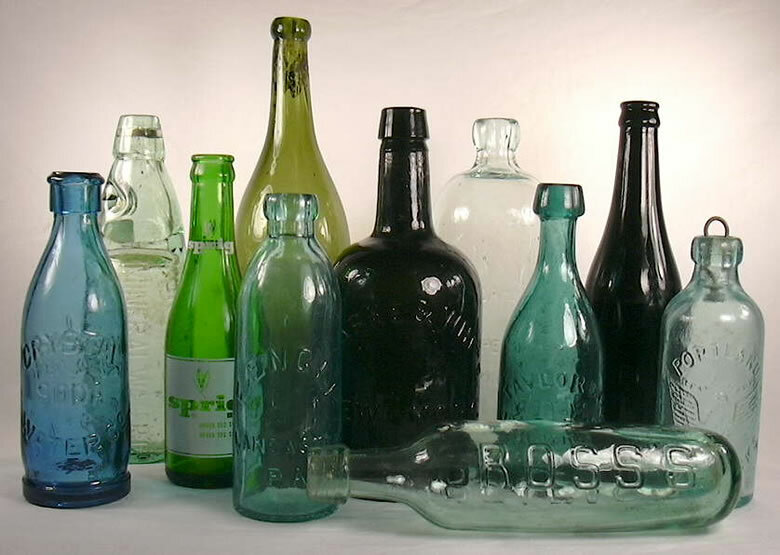 Vintage Water Bottles: Early bottled waters were sold in fancy, colorful, glass bottles. These bottles were expensive to produce and expensive to transport. The special packaging created an impression of value and luxury to justify their high price. BLM Image. Bottled Water Sales: Bottled water sales have been increasing strongly for over a decade with only a slight dip during the recent recession. Data from the Beverage Marketing Corporation. Bottled water sales are still exploding! During 2016, Americans consumed about 12.8 billion gallons of bottled water. This is a new volume record. That is about 40 gallons or 306 single-serving bottles of water for every person in the United States. The total value of bottled water sold in the United States during 2016 was approximately $16 billion. That was a record high dollar volume of sales. In the year 2016, bottled water passed up carbonated soft drinks to become the most consumed packaged beverage in the United States. Plastic Bottles: Today most bottled water is sold in single-serving bottles. People purchase them because they are convenient, fast, and easy. In the United States, on average, hundreds of bottles of water per person are consumed. Image copyright iStockphoto / @laurent. The economic value of "special water" was first cultivated in Europe during the late 1700s, when people began visiting natural springs to drink the water or bathe in it. Then in 1767, Jackson's spa in Boston began bottling their popular water. This enabled them to share their water with people over a broad area and increased their income. In the early days of the water industry, "mineral water" and "spring water" were the most popular types of bottled water. Many people believed that "mineral water" had a medicinal effect and that "spring water" had a special purity because it had just emerged from the ground and had not been used. The bottled water industry was born with these "perceived benefits," and they remain a driving factor for sales. Treatment of Natural Waters: Waters drawn from natural sources are filtered and treated to assure that they meet the standards of the Food and Drug Administration before they are bottled, labeled, and distributed for public sale. The source and nature of the water is indicated on the label according to FDA requirements. Image copyright iStockphoto / prodrive2002. In the United States, water delivered by public water supplies is regulated by the Environmental Protection Agency (EPA). Bottled water is regulated by the Food and Drug Administration (FDA). These two agencies have different standards for the water that they regulate. In general, EPA's quality standards are higher because it is sent out to a much larger number of people. However, FDA does have strict standards of purity and labeling that must be met by all manufacturers of bottled water. 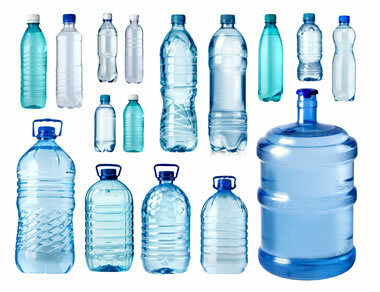 A Diversity of Bottles: The companies who produce bottled water package it in containers of diverse shapes, sizes, and styles. Each is intended for a specific type of end use or a specific marketing program. Image copyright iStockphoto / alenkadr. Is Bottled Water High-Priced Tap Water? It often is. About 25% of the bottled water sold in the United States comes straight out of a tap. It can cost over 1000 times as much as tap water. The FDA requires bottlers to identify what type of water is in every bottle. If the label says "from a community water system" or "from a municipal source" or something similar, you are buying the equivalent of tap water. The bottler might treat municipal or community water so that it meets the United States government's definition of "purified water," "demineralized water," "deionized water," "distilled water," or "reverse osmosis water." It can then be labeled with those names. All of this processing, bottling, and labeling has a cost. Generally, the highest cost waters are those in single-serving containers. When water is purchased in larger containers, the cost per gallon declines. 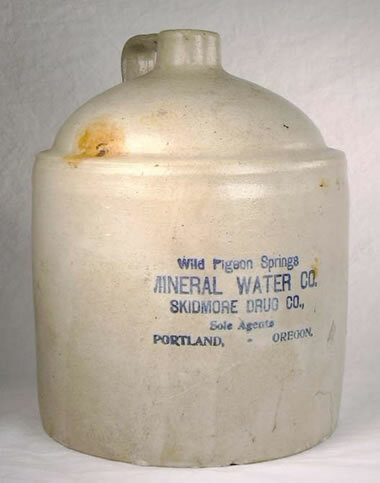 Vintage Water Jug: An early jug used for the sale of mineral water from Oregon's Wild Pigeon Springs. Mineral water was traditionally consumed at the spring where it was produced. Then, enterprising businesses decided to bottle it for distributed sales, in this case by the Skidmore Drug Company. Image by the United States Bureau of Mines. Some bottled waters are specially produced and marketed as being from a natural water source. These are also regulated by the Food and Drug Administration and must be labeled according to FDA definitions. Listed below are some of the more common water identities. "Mineral water" is a natural water produced from a well or spring that naturally contains at least 250 parts per million total dissolved solids. These dissolved solids could be considered impurities. However, some people believe that the dissolved minerals provide specific health benefits. There are very few rigorous studies on the health benefits of mineral waters produced from specific sources. The FDA does not allow the producer to add additional minerals to the water or claim that mineral water provides any unproven "health benefit." "Spring water" must be produced from a natural spring. A spring is a location where water flows naturally to earth's surface. In the past, many people believed that spring water was special because it emerged from the ground and had not been used before. However, the processes which form springs are now well understood, and the water that flows from them is simply groundwater with no special qualities. Artesian Aquifer: Cross-section showing an aquifer tapped by artesian wells. Pressure within the aquifer forces water up the wells. The well on the right side of the diagram is a flowing artesian well that yields water without pumping. The artesian well on the left has a water level that is higher than the top of the aquifer; however, it is not a flowing artesian well. USGS Image. "Artesian water" is water produced from an artesian well. To be an artesian well, the water in the aquifer (a subsurface rock unit that holds and transmits water) must be under enough pressure to force it up the well to a level that is higher than the top of the aquifer. Although this is an interesting geological situation, artesian water has no special chemical or medicinal qualities. "Sparkling water" is produced from a spring or well that naturally contains dissolved carbon dioxide - thus the water is naturally carbonated. 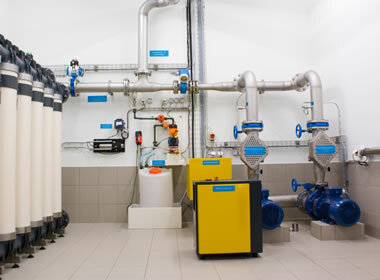 The producer may artificially replace any carbon dioxide that is lost during processing but may not add more than what the water had when it emerged from the ground. Although this is a rare geological situation, the water is a novelty rather than being a product that provides special health benefits. Well Water: Cross-section showing deep and shallow wells used to produce groundwater. The deep well penetrates to a depth below the seasonal low water table. It has the ability to produce water during times of drought when the water table falls and shallow wells go dry. The shallow well is not deep enough to produce a sustained flow of water during times of drought. USGS Image. "Groundwater" and "well water" are names used for water that is produced from a well that penetrates the water table. The water table is a level in the ground below which all pore spaces are filled with water. Many community and municipal water systems produce their water from a well. There is nothing special about these waters. They have no natural properties that make them superior to other commercial waters. They are what many people on public and private water systems receive from their tap every day. 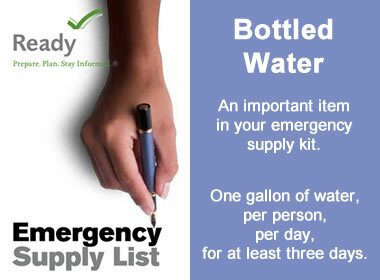 Perhaps the most important use of bottled water is as a source of emergency supply. When water supplies are cut off or contaminated, bottled water is often the only readily available source of water. Many individuals, families, companies, organizations, government agencies, and the military hold stocks of bottled water for emergency use. If you regularly use bottled water, this doesn't have to be an expense. Just buy ahead and rotate your stock. Water for Emergency: When a disaster such as a hurricane, flood, or earthquake strikes, water distribution systems are often damaged or contaminated - making tap water unavailable or unsafe for use. This is when bottled water is extremely important. Bottled water is a priority item in a family's emergency supply closet. 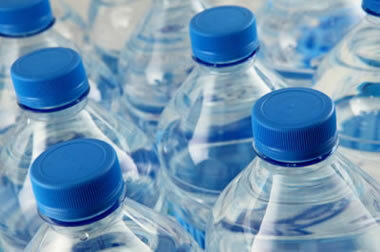 Commercially bottled water can be stored for about two years. If you are drinking bottled water because you think that it is more pure, better for your health, or safer than community or municipal water, you are probably not getting your money's worth. The purity standards for bottled water set by the Food and Drug administration are no higher than those applied to tap water set by the Environmental Protection Agency. In some instances they could be less rigorous. One concern about tap water that motivates many people to drink bottled water instead is "taste." Some people don't like the taste of their tap water so they drink bottled water instead. Some companies produce flavored waters to increase the appeal of their product. 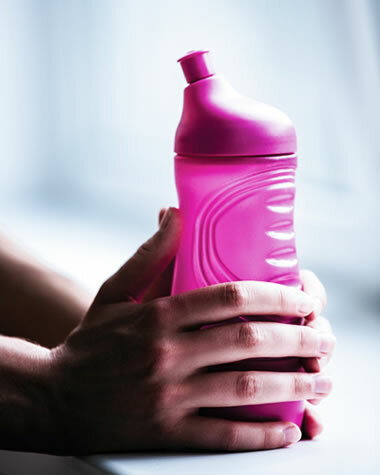 Save Money - Bottle Your Own: If you like bottled water, you can save a lot of money by obtaining a few personal water bottles and filling them with water at home. Add a slice of fruit or a few drops of flavoring for a refreshing treat. Personal water bottles come in a range of sizes, shapes, colors, and styles. You don't even have to buy one; just recycle any type of beverage bottle. Image copyright iStockphoto / ProfStock. Why Pay Big Money for Bottled Water? The benefits of bottled water are mainly convenience and novelty. Instead of buying bottled water, you can carry a canteen or a drinking cup and save lots of money by drinking tap water. Bottled water can cost thousands of times more than water from a tap! Drinking tap water will also help the environment because plastic water bottles require resources to produce, they are one of the major sources of plastic going into landfills, and, shipping billions of gallons of water every year uses a lot of fuel! If you think drinking bottled water instead of tap water has health or environmental benefits, you are probably not getting your money's worth. The REAL Benefit is What You Didn't Drink! Water has no calories, no dissolved sugar, no alcohol, and no caffeine. If you regularly drink water as a replacement for soda, beer, coffee, or iced tea, you are probably making a healthy choice. Drink water instead of iced tea or coffee to lower your caffeine intake. Quench your thirst with water instead of a beer and you might avoid a beer gut or a fender-bender on the way home. Avoid sugared drinks to lose weight or avoid tooth decay. Those are some real benefits of bottled water - or tap water. It's easy to drink water as an alternative beverage. So, start thinking of water as an alternative beverage. Bottled water and tap water are both healthier to drink than most of the alternatives. Drink bottled water when you need convenience. Drink tap water to save money and preserve the environment.